We’ve all seen recent headlines – the CIO is back. But with IT being increasingly managed and influenced by other business areas like Marketing and Operations, our IT leaders have had to make great efforts to retain ownership and control of certain IT functions, while also having to work in greater alignment with related business areas to achieve common goals. Today’s Chief Information Officer is no longer just a CIO – introducing the rise of what we at Macquarie Telecom like to call the ‘CI-Know’. IT leaders today have a much clearer view than ever before of what they want from their infrastructure – and in this information-rich age, they’re able to draw on a vast swathe of research, data and guidance to help them make IT-related decisions, even before they engage with a vendor. Armed with these new levels of knowledge, the CI-Know is taking increasing control over the design, implementation and delivery of their infrastructure. 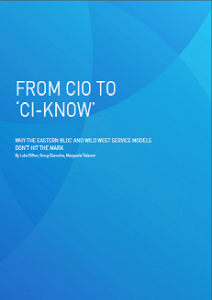 Often creating their own technical solutions, the CI-Know is no longer working from the ground up – and their requirements don’t easily conform to the two main service models generally offered within the Australian market – ‘The Eastern Bloc’ and ‘The Wild West’. This supports the CI-Know trend that we announced to the IT media a few weeks ago – whereby customers are moving away from vendor built, one size fits all, expensive and inflexible options that are typified by Telstra and Optus – but not heading all the way to simplistic, customer built, unsupported cheap and nasty solutions typified by Tier 3 transport layer carriers and global online hosters such as Rackspace or Amazon Web Services (AWS). Based on this shift, it’s clear that our IT professionals are increasingly looking to partner with a provider who can give them the high levels of support, flexibility and control that they need, based on their new working practices, knowledge levels and business requirements. Over the past 12 months, Macquarie Telecom has signed over $176m in total contract value across all of our lines of business of Voice, Data, Mobiles and Hosting. Interestingly 57 of these significant mid market corporate contracts and customers have been signed away from either Telstra or Optus, which is a rate of one customer per week moving away from an ‘Eastern Bloc’ provider. I recently published a whitepaper that considers the changing landscape of ICT in the Australian market. The whitepaper details why Australian businesses are no longer satisfied with the models available to them that have typically been studied and adopted from The US or Europe, and forced onto the much smaller Australian market. Download a free copy of the whitepaper here to learn how bringing choice, flexibility and control to the service delivery model in the Australian market is crucial. The time of the CI-Know is now.